Single-seater racing, the holy grail of motorsport – a purpose-built racing chassis crafted for speed and handling, rather than a modified street-legal vehicle altered to make it work on the race track. 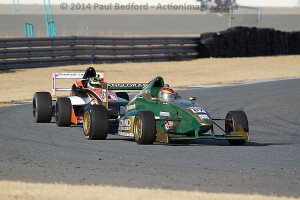 That is the allure of the South African Single-Seaters field. Two formulas, in one field, with one goal – to go as fast as possible within the rules set forth in the series. In the Formula Volkswagen championship it is Robert Wolk (1 – Midas / Chemical Logistics / ATE) and Nicholas van Weely (87 – Anglorand) who currently set the pace for the rest of the field. These are the frontrunners and between them the championship winner for 2014 will emerge in the Formula Volkswagen championship. Van Weely took over the championship lead from Wolk, the early leader in the series this year. Wolk has most recently been working hard to get that lead back and the points are close – just four points between them – with just two rounds left in the season. Killarney hosts the penultimate round of the championship on Saturday, 27 September, where these two will again be in the fight for the points needed to claim the title. The chances are good, based on the performance of each racer so far this year, that the Killarney event is simply a scene-setter for an action-packed finale at Zwartkops later this year. In the Formula 1600 category it is Scott Temple (3 – Investchem) who leads from Keegan Campos (02 – Hollard Insurance). Temple’s lead of nine points does not allow him much rest as he and Campos have been embroiled in several battles this year, with really close racing featuring in their on-track fights. The last two events will see Temple having to defend cleverly against a hard-charging Campos who knows he can win – and will be looking for every available opportunity to make that happen as he works on his chance to claim the title in the final rounds of the season. Further afield, South African racer Jayde Kruger continues his campaign in the Dunlop MSA Formula Ford championship in the UK. At the last outing of the season, at Rockingham Raceway, Kruger recorded his 10th race win of the season with continuing hopes of closing the gap to the championship leader in the remaining rounds of the season. The South African Single-Seater field will put in some of the fastest laptimes of any category at Killarney on Saturday, proving again while this form of racing remains an evergreen choice for drivers who want to compete at the edge of speed and handling. Race fans can look forward to a day of drama as they jostle for track position and flag honours over two races.